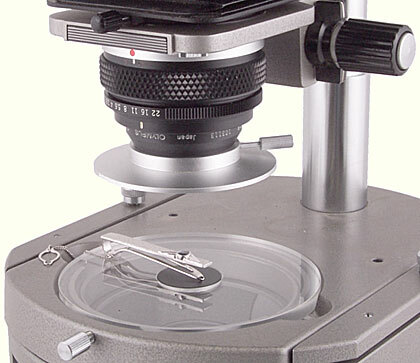 Olympus has a well-deserved reputation for innovation in macrophotography, but has here adopted an invention from the 1700s, the speculum of Dr N. Lieberkühn, which used a flame as its light source. 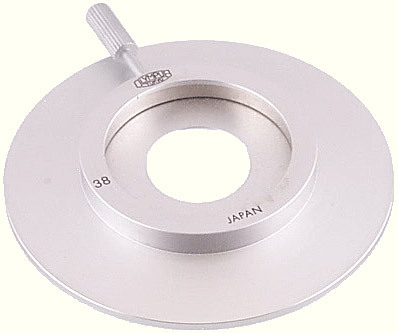 The speculum, now called a reflector, is designed to reflect a parallel beam of light and focus it onto the subject. The Olympus version is made of aluminium with a semi-matte finish. There are two models, the PM-LM-20 for use with the Zuiko Macro 20 mm f/3.5 lens and the Zuiko Auto-Macro 20 mm f/2 lens, and the PM-LM-38 for use with the Zuiko Macro 38 mm f/3.5 lens and the Zuiko Auto-Macro 38 mm f/2.8 lens. 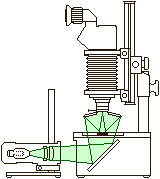 Light from the Trans-Illuminator is reflected by the Centering Mirror in the Trans-Illuminator Base, passes upwards through the transparent area of the Shade Stage Plate, and is then reflected down by the Lieberkühn reflector, onto the subject, which rests on one of the opaque interrupter plates in the centre of the Shade Stage Plate. Only one version of each model is known. Instructions were not provided with the Lieberkühn Reflectors.